As Indiana State University's class of 2009 graduated Saturday amid an uncertain economy, they heard inspiration from a 1979 graduate who said ISU gave him the chance and the confidence to act on his inspirations. Roger Schmelzer entered Indiana State just months after his dad died of a heart attack at age 51. His mother had already died. In his first two weeks on campus, Schmelzer had scored the lead in the university musical and landed the lead in another play later the same year. And he wasn't even a theater major. By his sophomore year, he caught the political bug as a student government representative and was a sportscaster on the campus radio station. Schmelzer went on to complete bachelor's and master's degrees from Indiana State and a law degree from Indiana University. He's enjoyed a successful career in government and financial services and is currently president and chief executive officer of the National Conference of Insurance Guarantee Funds. At Indiana State, Schmelzer said, he learned and lived "The Power of 'And,'" the title of his alumni commencement address. The power of "and," he said, is "the realization that you have a capacity to perform at a very high level in many different areas. It's the understanding that you can, indeed must, define yourself lest someone else do it for you. It's knowing the difference between the transactional and transformational acts that make up our lives. It's distinguishing a 'to do' list from a dream." Schmelzer told of starting a full time job as an aide to the Indiana Secretary of State on the same day le started law school, "without a single clue as to how I would do either one," but the power of "and" made both things possible and gave him the focus to turn things around after making immature choices early in his career. "The power of "and" is the choice to have hope where there is uncertainty or worse, hopelessness. And having hope certainly makes every day easier, more gentle," Schmelzer said. Click here to read the prepared text of Roger Schmelzer's address. To graduates about to accomplish the next step in their lives, student commencement speaker Sadie Davis built her remarks around shoes, noting that "a good pair of shoes, sturdily built and well cared for, will take us anywhere we need to go. For us, ISU has been and will continue to be that dependable pair of shoes, the foundation upon which we walk so proudly." Her experiences at Indiana State -- in shoes ranging from high heels for business functions to flip-flops and sneakers for more laid-back events -- have allowed her to "walk a mile in another person's shoes,"Â she said. "I have participated in service learning events in Terre Haute and Chicago. My fellow students have rebuilt homes in Mississippi and served food to those in need. They have taught children English and raised money for hospital patients," Davis said. "Students at ISU truly understand how they can help their communities, whether they be local, national or global. We know that our degrees come with both praise and obligation, and I have no doubt that this class and many classes to come will do its part to improve the world." Davis said Indiana State University has given all its graduates "a chance to stride into successful futures and I know that these shoes will last a lifetime." The next step in Davis' life comes this fall when she will enter the Maxwell School, a graduate school of social science at Syracuse University. She plans to enroll in a dual degree program in international relations and public relations. Click here to read the prepared remarks for Sadie Davis' student commencement address. 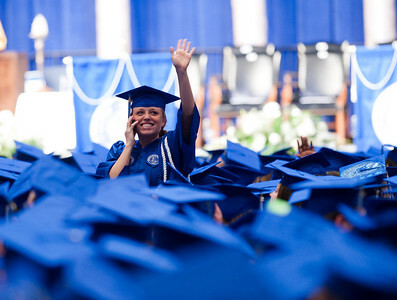 Nearly 1,300 graduates took part in Indiana State's 138th commencement. A moment of silence was observed for Gerald Smith of Avon, whose body was found Friday evening in the Wabash River at Vincennes. He had been missing for more than a week. Gerald Smith would have graduated Saturday with a bachelor's degree in insurance and risk management. Following the moment of silence, Nancy J. Merritt, dean of the College of Business, presented his diploma cover to his mother, Robin Hill, who was seated in the audience next to Cheri Bradley, wife of Indiana State President Daniel J. Bradley. Nearly 1,300 graduates took part Saturday in Indiana State University's 138th commencement. They heard words of inspiration from an alumnus who graduated 30 years ago and from a classmate who aspires to a career in public service.